I don’t much relish hangings, even though fortunately those which I’ve experienced have been of an artistic nature. Today’s at Sutton Library in south London (or for those who still believe the Post Office, Surrey) was a rather lengthy slog, and the show with the hardly inspiring title ‘Eight Photographers‘ remains on show only until Nov 15th, and on the 16th gets taken down to make way for a barn dance. 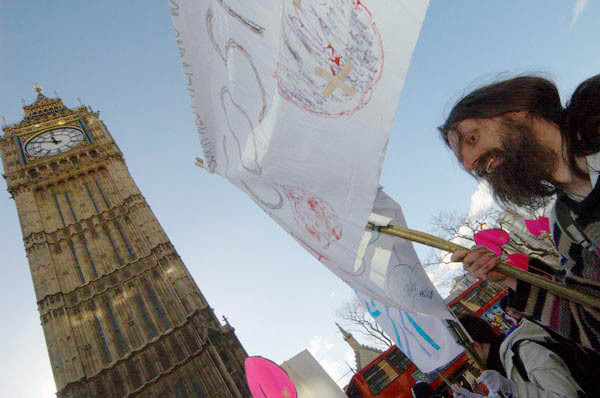 ‘Kiss-It’ protest against violence in Mental Health treatment, London Feb 2005. Among the other seven egos laid bare on the white walls are a number of photographers I’ve known for a long time, including Sam Tanner, whose images of his own mother’s last years are a sensitive, loving, poignant and very human document. David Malarkey has caught and enlarged the diffraction of light in a way that can be very striking, especially when glimpsed out of the corner of an eye, although they also have an unusual quality seen close to. Carol Hudson‘s four panoramic images come from her local street, and one which includes a startling pink pedestrian blur along with a static figure, other people and a bus particularly caught my attention. Tony Mayne was the only among us to have worked to give the show some particular local interest, his three blocks of nine images each showing people on the high street a few yards away. Also exhibiting are Nick Hale, Darren McCloy and Len Salem. Sutton Library looks a superb library, in a new civic centre for the London Borough of Sutton, just off the High Street, a short walk from Sutton Station (it felt further when I was carrying 8 framed pictures.) It has a nice exhibition space, although unfortunately there doesn’t seem to be a coherent arts programme there (and I certainly can’t find any details of this show on the London Borough of Sutton web site), and it is also used for other types of event – such as the barn dance. Ask Sutton not me if you want details of that. This entry was posted on Monday, November 5th, 2007 at 10:15 pm and is filed under My Own Work, Photographers. You can follow any responses to this entry through the RSS 2.0 feed. You can leave a response, or trackback from your own site.